This fascinating bibliography of source materials clearly demonstrates the significant roles blacks have played in the history and culture of Canada from its beginnings as well as their 400-year fight for equity and justice. Organized by area of endeavor and by province, the source materials detailed here reveal that blacks in Canada have created a rich, diverse, and complex legacy. This volume lists resources that point to blacks' history as soldiers, prospectors, educators, cowboys, homesteaders, entertainers, legislators, athletes, artists, servants, and writers. 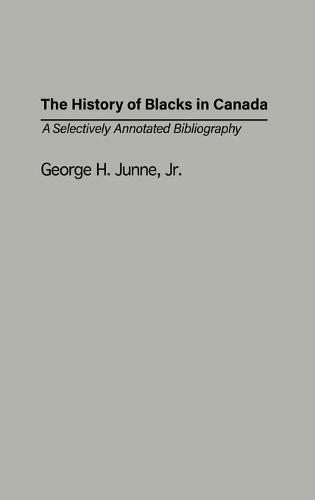 The most comprehensive bibliography about blacks in Canada that has been published, it is well organized to facilitate locating specific topics or people spanning black history. Also included are newspapers and videos that add their own unique contribution. Academicians, researchers, students, and interested lay people will find an organized compilation of a vast number of primary and secondary sources about blacks in Canada.